Typically, we set our sights on the perfect body (probably inspired by something or someone we saw on a magazine or social media!) and begin manically working out to take us even a step closer to it- but the truth is, our diet and nutrition should be the first thing that we initiate change upon. After all, it is our nutritional compass or habits that determine the physical fuel or energy we have available for the gym or other fitness activities. And quite often, we will burn out quickly and tire of our workout regimen unless we are fueling ourselves adequately. With that in mind, we can re-frame our thinking and set some clear dietary goals to work towards so that we can energize ourselves and live a much more vibrant and nourishing existence. Luckily for us, supplements are plentiful in the health and fitness arena and many can be helpful for getting our bodies back up to balance- they can kick-start us as we begin to pay a little more attention to what and how we are eating. Without that balance, we will keep falling short of the healthy living we aspire to create. So, here are some tips to help you out! The cleaner the food that we eat, the better we shall be for it. This means processed foods that clog our body and weigh us down with an overload of sugar, salt, and artificial additives and preservatives need to be very limited. Opt to eat foods in their most natural state so you can absorb all the great nutritional benefits they can offer you. This may seem like a mountainous task…but it is doable, and it is possible with the proper focus and desire to get better with food. In respect of supplements, take time to shop around before you buy. Of course, a lot of this is trial and error, but just having a clearer vision of your objective from that supplement can really help you. As mentioned earlier, we are spoilt for choice on health and fitness supplements, and it is difficult to narrow down choices! Look for companies that you feel align with your health goals, lifestyle, and of course- your dietary emphasis. You can learn a lot about the product you are buying just by spending a little time on the details! We are confused by fats and their role in our physical makeup… and so we see them as the bad guys- when in actual fact they are not! (As long as we are eating the right ones that are!) There are many companies innovating supplements that help us achieve a more balanced intake of “good fats” and protein also. Level Up is one of them, here we take a closer look at their products and how they can inspire you to level up! Level Up is a line of nutritional supplements dedicated to "clean label", healthy-lifestyle, and keto-friendly products. A supplement fanatic created Level Up with passion! Their focus lies in creating truly premium products at a very reasonable price- a combination in the supplement industry has always been near impossible to find. Either product is cheaply made and affordable or they are high quality and expensive. Level Up knew it had to be possible so they started creating supplements to their own standards while keeping the prices realistic. Since they sell directly to their customers without middleman distributors, they are able to extend those additional savings to their valued base of customers. Level Up believes that life is meant to be lived to the fullest at every moment. Every day should be your best day. With a clear mind, the perfect amount of energy and the drive to turn an ordinary day into a journey... And they are right! Clean MCT®is the brand's original product and a true super-star. It is pure and premium C8 caprylic acid triglycerides. 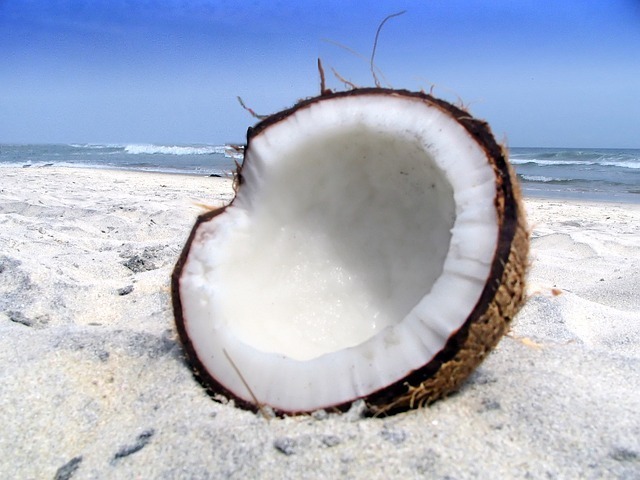 To put that into laymen terms, it is an ultra-refined coconut oil extract that isolates only the 8th carbon chain. Even that may sound too geeky. In order to break that down, we must quickly understand the difference in fat types. C8 is an MCT (medium chain triglyceride) this differs from "traditional" fats (long chain) in a manner that they are broken down for energy. Medium chains are instantly converted into energy whereas long chains fatty acids must go through a must longer metabolic process. C8 happens to be the most metabolically efficient of all the fatty chains, making it highly ketogenic - it instantly converts into ketones, which are burned for energy. This happens whether in ketosis or not, making it a fantastic staple for anyone on the keto diet. 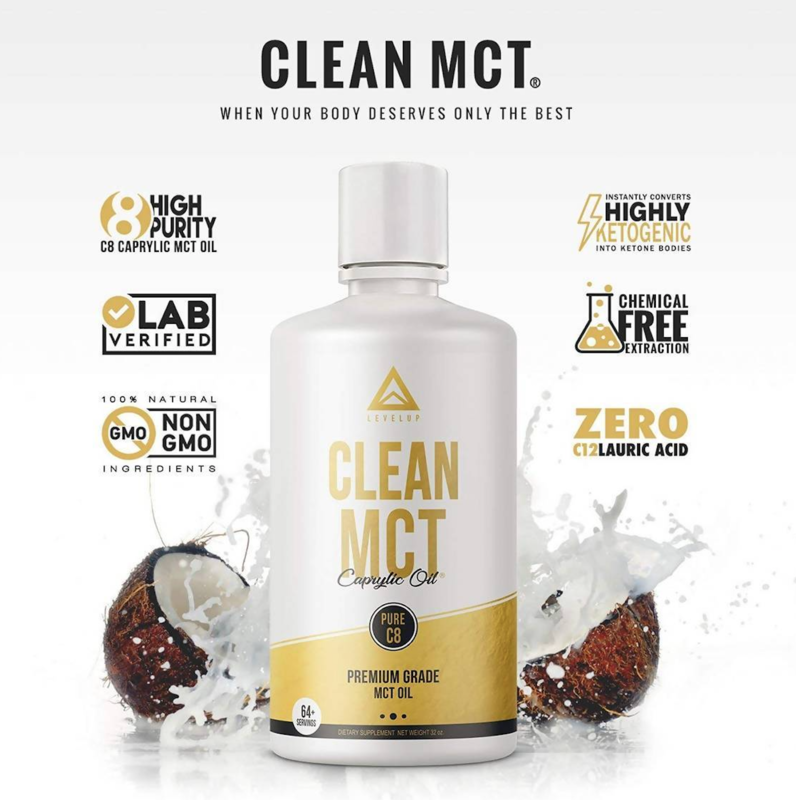 Clean MCT is ideal for anyone and not just those looking to support ketosis. The high-quality fuel that Clean MCT is makes it a premium fuel source for the brain as well. This makes it an incredible supplement for those who need a lift...without extra caffeine! Try Level Up’s original “Clean MCT®” Now! The most popular way of incorporating such as supplement is blending it into freshly brewed coffee with grass-fed butter. There are much cheaper MCT's on the markets and other C8 copycats, however, Clean MCT has the highest potency of C8, is extracted using a patented chemical-free process and is triple filtered for a finished product that is completely tasteless, odorless and colorless. Lots more on offer at Level Up! Multi-Collagen has been a real hit lately. It is a unique formulation of various collagen sources (grass-fed cow, wild fish, free-range chicken, and eggshell membrane), but it is also further enhanced with biotin, hyaluronic acid, MSM, and glucosamine. This makes this product a superstar for supporting healthy hair, nails, joints, skin and gut health. The benefits are truly inside and out. “At Level Up, our objective is to help you live your journey to the fullest. Every product we develop comes with the same objective of making every day the best it can be by literally taking your health to the next level. If a supplement does not make a noticeable difference in your life, we won't make it! Our commitment is helping every one of you live life better, brighter and bolder…level up your nutritional destination!” said Level Up. * In partnership with our friends at Level Up.